Eli Pittman scored 29 points with five shots from beyond the arc to lead the varsity Eagles past Florence Nov. 20 in a non-district road game. Salado scored 22 points in the first quarter and held the Buffs to a measly six points. The Eagles led 36-14 at the half. Salado extended the lead to 50-22 at the end of the third. Pittman hit all five of his three-pointers and scored 19 of his game-high 29 points in the first half. Sammy Brown hit two three-pointers on his way to a 10 point performance. Jeremy Jarvis also had 10 points, eight in the fourth quarter. Also scoring for the Eagles were Zack Shaver, six points, Nathan Eschmann, three points and Cayden Meyer, one point. Salado Eagles were not kind hosts to the Rosebud-Lott Cougars on Nov. 19, sending the visitors home with a 67-39 shellacking. The Eagles outscored Rosebud-Lott 13-6 in the first quarter and 27-15 at the half. Salado had a 30-point lead, 57-27, going into the final quarter. Junior Eli Pittman led the boys with 18 points. He hit four shots from long distance, scoring 11 points in the third quarter alone. Zack Shaver also scored double figures for the Eagles with 12 points, 10 of them in the second half. 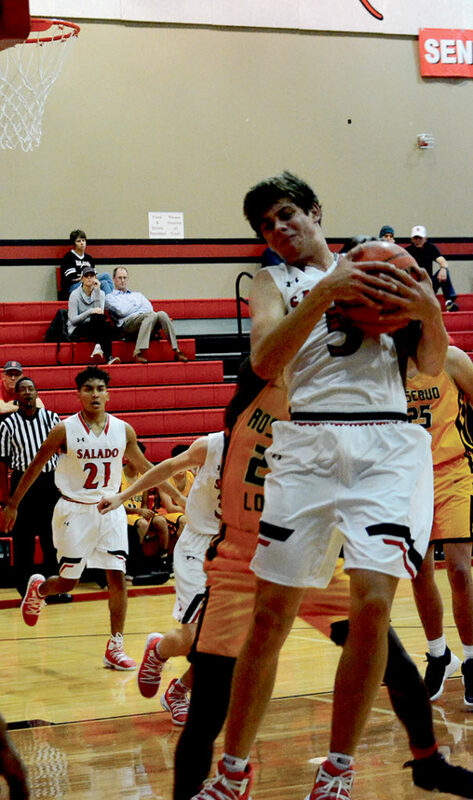 Also scoring for Salado were Jeremy Jarvis and Peyton Miller, eight points each, Cade Scallin, and Reece Brown, seven points each, Sammy Brown, three points and Cayden Meyer and Nathan Eschmann, two points each. Salado JV Eagles beat the Rosebud-Lott Cougars 59-25 in a non-district home game Nov. 19. The JV Eagles led 22-9 in the first and 30-14 at the half. Going into the fourth quarter, Salado led 46-16 holding the Cougars to just two points in the third. Josh Goings led the JV boys with 20 points. Nathan Hansen scored 11 points, including three three-pointers. Also scoring for the JV Eagles were Latrell Jenkins, eight points, Kole Maedgen and Noah Mescher, six points each, Austin Abel, four points, James Perry, two points and Caleb Sirmon and Blake Miller, one point each. Josh Goings led the JV Boys past Florence 62-25 in their home win Nov. 20. Salado Eagles freshmen boys basketball team got its first win of the season with the 38-32 take down of host Florence on Nov. 20. Leading the way for the Eagles was Caleb Sirmon with 12 points.